Girls Nite Out at the Tack Room! 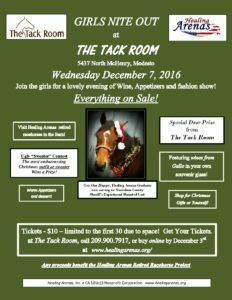 – Healing Arenas, Inc.
Join the girls for a fun Christmas themed night for wine, appetizers, shopping and fashion show! RSVP now as there are only 30 spots available! Get your $10 tix by clicking here, add $10 and type in GNO!